LOS ANGELES—The hotel lawyers of JMBM’s Global Hospitality Group® are pleased to present their updated Hospitality Credentials, which include clients and projects that represent more than $87 billion in hotel transaction experience involving more than 3,900 properties worldwide – more than any other law firm. JMBM’s Global Hospitality Group is the premier hospitality practice in a full-service law firm and the most experienced legal and advisory team in the industry. The Group publishes the Hotel Law Blog and hosts the annual Meet the Money® National Hotel Finance & Investment Conference (May 6-9, 2019 in Los Angeles). For more information visit www.HotelLawyer.com. Recently, my partner, Guy Maisnik, and I spoke about hotel retail mixed-use development with Kelsi Maree Borland of GlobeSt.com. Her article, Why Retail Owners Are Partnering With Hotels ran with the subtitle, With retail evolving to be more experience-driven, retail owners are finding the benefits of adding boutique hotels to shopping centers. Retailers adding hotels to the mix is nothing new – but they may be more motivated than ever. The Hotel Law Blog has been covering hotel mixed-use projects — where the hotel provides the catalyst for social activity at shopping centers, office complexes, and residential buildings — since 2009. At that time, retail sales were suffering due to the Great Recession. Add to this the spectacular growth of online sales, which accounted for 19.1% of total retail sales in 2018, and it is no wonder that brick-and-mortar retailers are hurting. Some, like Sears and JC Penney are scrambling for survival. What retail properties are good candidates for a hotel, and what should owners interested in including a hotel look for? The Lodging Conference is taking place at the Arizona Biltmore in Phoenix, October 30-November 2, 2017, and hotel lawyers from JMBM’s Global Hospitality Group® will be there to visit our friends in the hospitality industry, share our knowledge, learn from the experts (and do some deals!). At the conference, I will moderate the panel, Navigating the EB-5 Landscape taking place at 4:00 pm on October 31st. Funding obtained through the EB-5 Immigrant Investor Visa program continues to play a vital role in the capital stack for new hotel development and we will provide up-to-the-minute information on the status of the program, as well as share some great success stories. To get up to speed on what’s happening with EB-5, check out my recent blogs. ADA Hospitality Defense and Compliance Lawyer: Hotel mixed-use projects have proliferated over the past decade or two — projects that combine a hotel with retail, residential, entertainment, office and other uses. In recent years, many of these projects combine hotel and shopping center elements. We are big fans of hotel mixed-use. Over the years, we have written about the numerous advantages that accrue to both hotels and shopping centers, when hotels are added to the right shopping or retail center. One study showed that the right hotel can boost gross sales at shopping centers 20% – 40% — and hotels can get 30% – 40% RevPAR advantage over hotels in their competitive set. In the article below, my partner, Marty Orlick, writes about one aspect of common area liability that you may have overlooked in defense to ADA violations. Of course, the ultimate analysis will depend on the precise facts of the situation at hand and the structure of the hotel’s participation in the mixed-use project — particularly whether or not the hotel is owned in fee or is a tenant in the project. are not liable for ADA violations in common areas? Click here for the latest articles on EB-5 Financing. Editor’s note: The EB-5 program has been renewed! The article below describes the changes to the EB-5 Immigrant Investor Visa program that were ALMOST enacted in December 2015. At the eleventh hour, Congress completely shelved all the proposals discussed below, and instead decided to continue the program, without any change, through September 15, 2016. Hotel Lawyer preview of the new EB-5 financing rules. The “new breed” of condominium hotels — Key to financing new hotel development? Selling condo hotels as “securities” under new SEC Rule 506(c) . . .
Click here for the latest articles on Condo Hotels. The condo hotel lawyers at JMBM have helped clients with more than 100 condo hotels and hotel condos. Our experience proves that well-structured condo hotels play a valuable role and have earned an enduring legacy in the hospitality industry. They make new hotel development feasible where limited financing and high construction costs would otherwise be prohibitive. And now one recent legal change sweeps away some of the knotty issues that have hampered condo hotel growth, and reignites the popularity of this approach with a “new breed” of condo hotels. We are now at a pivotal point for condo hotels. We are witnessing the complete turnaround in the way developers will structure condo hotel deals — particularly for high-end and luxury properties. This 180 degree turnaround in approach is creating a new and better breed of condo hotels that builds upon past successes and takes a giant step forward. This is a big change! Over the past 50 years or more, with only a few isolated exceptions, all condo hotel deals were tortured monstrosities of legal convolution. Because of the prior securities laws, it was not practical for most developers to have their offering be considered a “security” because it was not practical to register the securities with the SEC (as in an IPO), and general public solicitation is essential to the sale of real estate like condo hotel units. However, under the prior law, achieving the critical “non-security” status imposed some nonsensical legal requirements. Most of these absurdities resulted from the fact that investors typically buy condo hotels as an investment and want the kind of information that would be relevant to making an intelligent investment decision. However the prior SEC rules effectively prevented developers from selling condo hotels as an investment with the relevant information and structure to provide the greatest prospects of success. This created the practical paradox that it was illegal for developers to sell condo hotels as an investment, but it was not illegal for buyers to purchase condo hotels as an investment (and most buyers did so). In other articles, we intend to provide more background and detail for those who are new to the condo hotel scene. But this piece is designed for those who already know the basics, and perhaps even struggled with the limitations of condo hotel structure under the old rules. Thus, we move straight to the key considerations that hampered condo hotels under the old rules, and explore how the “new breed” of condo hotels (structured as securities to take advantage of the latest legal changes) is now positioned to become the dominant approach for this entire niche. The table below summarizes some of the most significant requirements or features that distinguish the old approach of avoiding security status (and the old SEC rules on private offerings), from the new approach of accepting security status and complying with the new Rule 506(c). The critical requirement for the new approach is that all buyers of condo hotel units must be “accredited investors.” Generally speaking, this means that each purchaser must meet the requirement of either (1) a minimum net worth of $1 million (excluding primary residence), or (2) a minimum income of more than $200,000 per year (or $300,000 for a married couple) for each of the last two years, and reasonably expects the same for the current year. Hotel Lawyer on Hotel Mixed-Use. 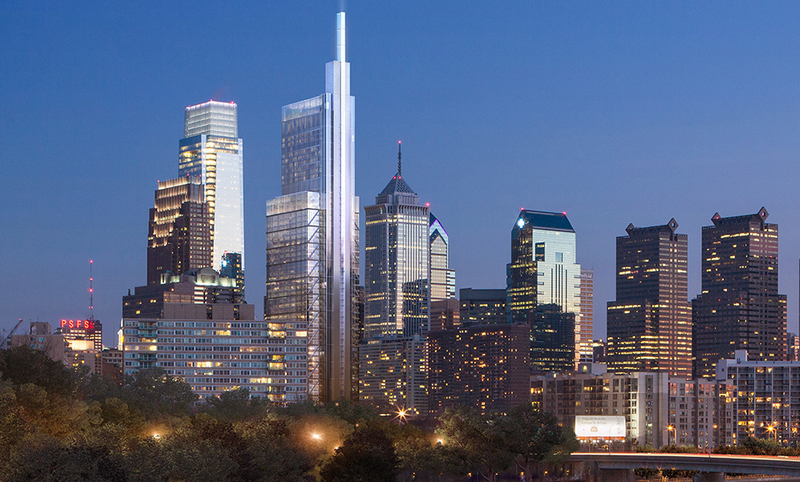 Proposed $1.2 billion, 59-story Comcast Center with Four Seasons Hotel in Philadelphia, PA.
JMBM’s hotel lawyers are proud to be the hotel legal and advisory team for the developers on the Four Seasons luxury hotel component of this spectacular project. This is one of the high-profile hotel-retail-office mixed-use projects we have been working on for more than a year. Hotel mixed-use is back! Hotels are being added to projects with retail, residential, office, entertainment and other uses — and the multiple uses enhance each other’s value, so the value of whole is worth more than the sum of the parts. If this subject interests you, see the links below the press release. Here is the press release from Comcast and Liberty Property Trust announcing the project. Designed by Lord Norman Foster and developed by Liberty Property Trust to achieve LEED Platinum Certification, the 59-story tower will include a Four Seasons Hotel. Thousands of jobs and billions of dollars of economic activity will be created in Philadelphia and the Pennsylvania commonwealth. Comcast Corporation (Nasdaq: CMCSA, CMCSK) and Liberty Property Trust (NYSE: LRY) announced today they will jointly develop the “Comcast Innovation and Technology Center” on the 1800 block of Arch Street in Center City Philadelphia. The proposed $1.2 billion 59-story, 1,121-foot tower will neighbor Comcast Center, Comcast Corporation’s global headquarters, and become a dedicated home for the company’s growing workforce of technologists, engineers, and software architects. The facility will also create a media center in the heart of the City by becoming home to the operations of local broadcast television stations NBC 10/WCAU and Telemundo 62/WWSI and offer space for local technology startups. Designed by world-renowned architect Lord Norman Foster of Foster + Partners, the glass and stainless steel tower will complement Comcast Center as a new energetic dimension to Center City. The 1.517 million rentable square foot project will include a new Four Seasons hotel and a soaring, block-long lobby with a glass-enclosed indoor plaza accompaniment to Comcast Center’s existing, dynamic outdoor plaza. The lobby will feature a restaurant and a new concourse will provide direct connections with SEPTA’s Suburban Station, enhancing accessibility and providing new options for commuters. The $1.2 billion mixed-use tower is expected to be the tallest building in the United States outside of New York and Chicago and will be the largest private development project in the history of Pennsylvania. Warning for hotel investors considering golf courses: Golf courses are different! They have different risks and require different skill sets. Hotel Lawyer with some insights on buying and developing golf courses. Hotel investors suddenly seem to be buying or building more golf courses. With the right expectations and circumstances, golf courses can make sense — particularly as an amenity for hotels, residential development and other real estate. But as more hospitality clients look at golf courses, it seems appropriate to consider the drivers of this renewed interest, and some of the similarities golf courses share with other hospitality investments such as hotels. And finally, we want to look at some of the big factors that make golf courses very different from other hospitality investments, so you can avoid some unnecessary pitfalls. Why the increased interest in golf courses? Interest in golf courses has likely increased for a number of reasons, including the continuing overall improvement in the economy, favorable projections for the hotel industry, the return of home builders to the active market, and the likely surge in new development in 2014 and beyond. In addition, it is now well proven that “mixed-use” really works, and that includes adding a golf amenity for hotels, condos, residential and other real estate product. On top of all this, there is a wave of Asian investment and tourism — particularly Chinese — that favors golf. Many of these investors and developers are familiar with hotels, and have established teams of experts that are familiar with hotels — but they often don’t have golf course-specific experience and capabilities. That is why it is important to realize that hotels are different (from golf courses) though they share a number of characteristics and are often both regarded as “hospitality” product. Recognizing the similarities and the important differences will enable investors and developers to fill in potential gaps of expertise to avoid unnecessary problems. The Hard Rock Hotel San Diego — a condo hotel — did NOT offer “securities” according to new appellate court decision in Salameh v. Tarsadia Hotel. Lower district court dismissal upheld. Hotel Lawyers on “hotel condo” units as securities (or NOT). One of the most significant challenges for developers of a condo hotel project is whether the sale of the condo units constitutes the sale of a “security.” If it does, the principals and sellers of the project will have much greater compliance issues, costs and liabilities, which could make the project unworkable. We have been advising clients on these issues in connection with more than 100 hotel mixed-use transactions since 2000. The deals usually have a significant residential component (condo hotels, hotel condos, single family homes or home sites, etc.) retail, entertainment and other uses added to a core hotel component. The Ninth Circuit opinion in Salameh v. Tarsadia Hotel (CA-9, No. 11-55479) discussed today provides a significant new level of comfort for all involved in such matters. The case was filed as a class action by Tamer Salameh and other named plaintiffs against some of the most respected people in Southern California’s hospitality industry, including Tarsadia Hotel, Tushar Patel, B.U. Patel, Gregory Casserly and other defendants. Notably, Playground Destination Properties, one of the first developers and most esteemed marketing companies for condo hotels, was also named in the action. If you don’t know what a condo hotel is, or how it fits into hotel mixed-used, we have an entire section of HotelLawyer.com and HotelLawBlog devoted to condo hotels and to mixed-use. Just use the search bar at the top for any subject or click condo hotels or mixed use! Great opportunity . . . and danger . . . await shopping center owners who seek to add hotels to their shopping centers, malls and retail centers. An interesting confluence of factors has ignited a wave of hotel development — adding hotels to shopping centers, malls and retail centers. This trend is already underway and will be headline news for the next couple of years. There are compelling synergies for both the shopping center and the hotel. These have been thoroughly documented by major players. One major shopping center owner performed a multi-year study on its 200+ properties and found that the right hotel can boost gross sales at shopping centers 20% to 40%. And the associated hotels also get a boost in Revenue Per Available Room (RevPAR) of 30% to 40% over hotels in their competitive set. If you need more information on the basics — why people are adding hotels to shopping centers and malls — look at the articles posted on www.HotelLawyer.com. From the home page, scroll down and look on the right-hand side for under “Hotel Development” or go to www.hotellaw.jmbm.com/hotel_development.